Special 3-month supply of Gentle Solutions Collagen AM, Gentle Solutions Collagen PM, Gentle Solutions C.L.A., a complimentary pill box and a BONUS extra bottle of CLA! The Tummy Saver Package is Gentle Solutions’ unique combination of the AM Formula, the PM Formula, and the C.L.A. These weight loss supplements are taken together for maximum results. This package is designed to help those individuals who have excess weight to lose in the mid-section (tummy area). The Collagen AM and PM are the driving force behind all our packages. While the Collagen AM and PM formulas help the body to build the lean muscle which strengthens the metabolism, the CLA works with the Collagen supplements to more effectively metabolize and block carbohydrates that cause belly fat. Collagen can aide appetite suppression. The distinctive structure of Collagen protein makes it one of the most satiating proteins. Studies suggest collagen protein is 40% more filling than other proteins and individuals who consume collagen protein will ultimately consume 20% less at subsequent meals. Collagen has been proven to help reduce fat mass and increase fat-free (muscle) mass. Increasing muscle mass in the body also increases the metabolism. The metabolism is responsible for burning the majority of the calories a body burns in a day while doing all the tasks of simply living. Therefore, increasing the metabolic baseline obviously works in favor of weight loss. Decreases abdominal fat -- Adrenal imbalances and hormonal shifts are common reasons for abdominal fat. 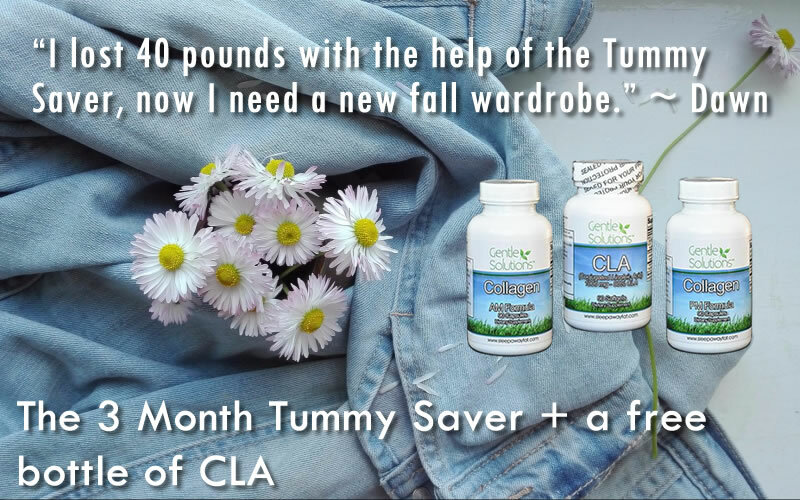 Gentle Solutions CLA can help to target that area and combat the belly fat. Enhances muscle growth -- Muscle burns fat, which also contributes to increased metabolism, which is useful in weight loss and management. Increases metabolic rate -- This increases the rate your body metabolized food. Lowers cholesterol and triglycerides -- Which reduces the risk of heart complications. Lowers insulin resistance -- Lowering the insulin resistance can also help prevent adult-onset diabetes and make it easier to control weight. Reduces food-induced allergic reactions -- Since food allergies can be at play when weight loss becomes difficult, this can be a huge benefit. Enhances immune system -- Enhancing the immune system's ability to function properly is a positive benefit to weightloss. Reduces body fat -- by decreasing the amount of fat your body stores. Maintains lean muscle -- by helping your body burn calories more efficiently. May prevent fat cells from refilling -- with fat, so you maintain your leaner look. To Take Gentle Solutions Collagen AM formula: Take 3 Capsules in the morning first thing when you get up and then DO NOT eat for an HOUR (you can drink water). To Take our Collagen PM supplement: stop eating 3 hours before going to bed (you can drink water) Then, just before turning in at night, take three capsules on your empty stomach and go straight to bed. To take the C.L.A. : Take 1 capsule twice daily prior to your two largest meals. Studies suggest CLA is most effective when taken up to 30-60 minutes prior to Lunch and dinner.